Why I read this book: The cover grabbed my eye. I was taking my last walk through a Borders two days before it closed, basket full of romance novels that were a dollar each, when I stumbled across this book in what used to be the biographies section. This is not biography, but the periodic table cover made me pick it up. There were quite a few left, but after some quick math in my head I decided that even if it was horrid, I may be able to pick up some tips could at least say I read it. 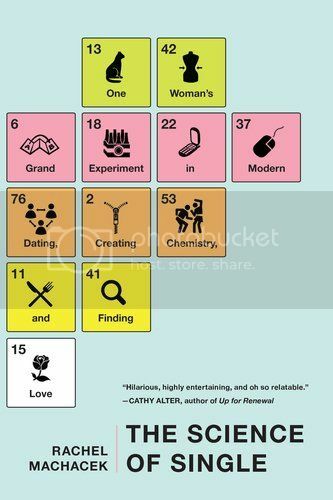 In the Science of Single, Rachel, our author, decides to make an experiment out of dating in the modern era. She takes different types, like online dating, blind dating, dating services etc. and dives into them headfirst while writing about her experiences. Most of her lucky suitors know nothing of the experiment. Rachel goes into the pros and cons of each but not in an out and out list. You can tell the pros and cons through her experiences, of which she writes in detail. She gives the guys cute little nicknames based on something about them. I quite enjoyed that, and then seeing them pop up later. To say one thing about the Science of Single, it does not lack entertainment. The way Rachel writes is very fluid and clear. It was easy to fall into each section and be absorbed by her journey. I would easily take a section and read it before bed time. The part that didn't quite capture me was Rachel. This bothers me to say, because she is a real person and it was sort of a memoir, but I just couldn't connect with her. We are very different people in the way we approach (or subconsciously avoid in my case) dating. The point being there were times where I just wrinkled my nose. Most of this was early on though, and what redeemed this for me was the fact that in the end she grows. And that is what I like to see, even in a story about dating, growth. So did I pick up any tips? A little There are a lot of options out there and each one may suit one of us more. Her foray into online dating made me want to give it a try. It was an interesting read, entertaining and well written. It was definitely not a waste of time, just a little hard to connect to at times. In summary, I would recommend it for the people who want to be entertained by one woman's attempt to decode the modern dating scene. I love this type of book. I recently listened to an audiobook called 51/50 which was about one woman who tried to date 1 guy a week or something like that. It was really interesting to see all of the different ways people approach the dating scene! That sounds really interesting too! For these books, I cant even fathom how they do them. Its a real commitment. Yep, this sounds uber interesting.